Hydrothermal vents discovered in the deep sea of the Caribbean are unlike anything scientists have ever found. Scientists say the active vents in the Von Damm Vent Field (VDVF) are unusual mainly because they are formed largely of talc—rather than the more usual sulphide minerals. 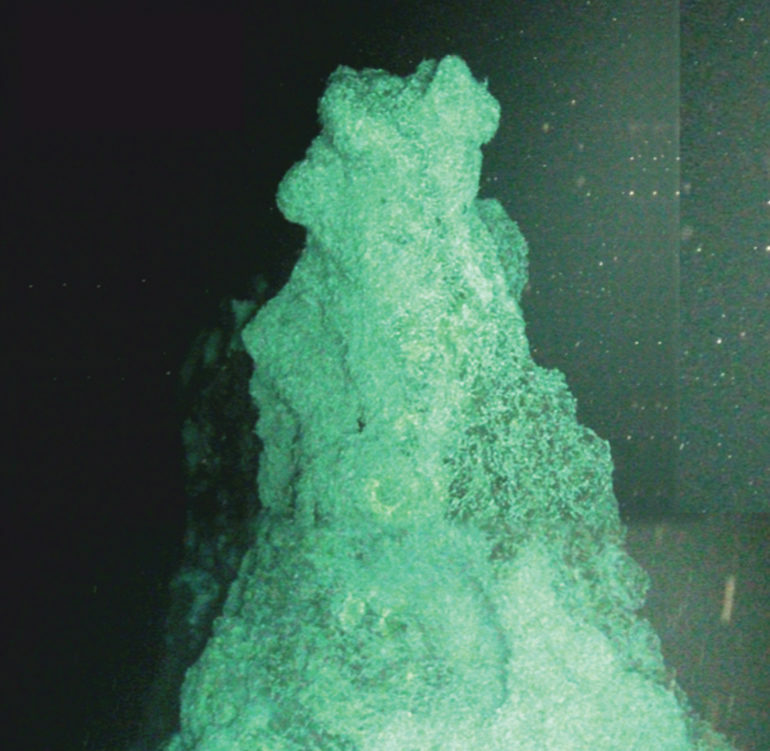 Researchers analyzed samples from the VDVF—a vent field south of the Cayman Islands discovered by scientists and crew on board the RRS James Cook in 2010. Their findings appear in the journal Nature Communications. “This vent site is home to a community of fauna similar to those found at the Mid-Atlantic Ridge in the Atlantic Ocean, but the minerals and chemistry at the Von Damm site are very different to any other known vents,” says Matthew Hodgkinson, a postgraduate research student at the National Oceanography Centre Southampton at the University of Southampton. “The discovery of this new class of vent system serves to demonstrate our limited understanding of the ocean floor and the importance of and role for ‘discovery science’ in the oceans,” says Steve Roberts, professor of geology. Hydrothermal vents form in areas where the Earth’s tectonic plates are spreading. At these sites, circulating seawater is heated by magma below the seafloor and becomes more acidic—leaching metals from the surrounding rocks and redepositing them as the hot water spews out of vents or ‘chimneys’ at the seabed and hits the cold seawater. The VDVF system also has a very energetic heat flux (the amount of energy it emits into the surrounding ocean) of around 500 megawatts—much more than would be expected since the VDVF, on the slopes of an underwater mountain and away from a large magma supply, is on the edge of a spreading area and not in between two separating tectonic plates. The unusual positioning of this new vent field suggests that other similar ones elsewhere in the world may have been overlooked, Hodgkinson says.